New Zealand All Cheats? Stats. There’s a lot of discussion about New Zealand getting away with cheating. Rugby fans, players, coaches and commentators from every country outside of New Zealand are convinced, but New Zealand, and crucially, the IRB seem to think that they’re not. [Many, many more – see sources in the post below]. “[The accusations are] actually becoming quite boring” – Steven Hansen, New Zealand Assistant Coach. “Accurate”, more like. 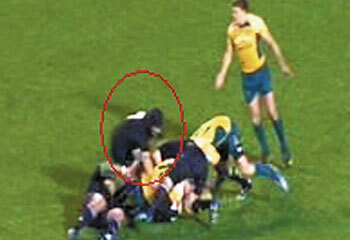 Having watched and re-watched the New Zealand play at the ruck, it’s clear to me that they’re getting away with it. Mike’s reply pertaining to scrums got me wondering what kind of stats are available on McCaw and New Zealand cheating. Wallabies v All Blacks Analysis of that Test shows McCaw failing to join the ruck from behind the last man’s feet at least seven times and contesting kicks while offside on at least three occasions. Despite being captured flagrantly entering the side of rucks and chasing in front of kickers, flanker McCaw proved “Mr Untouchable” by escaping without a single offside penalty. In the All Blacks’ Wellington win against the Springboks, Irish referee Alain Rolland penalised the Kiwis three times for slowing the ball at the breakdown. On the fourth occasion, Rolland told McCaw that “this is an official warning”. It was black comedy, All Black comedy. McCaw must have had to stop himself from laughing. It seems to me that the evidence is there that McCaw in particular, and the team as a whole, know how to play the refs very cleverly, and are getting away with it. The referees should be wise to it, but don’t seem to be. The IRB insisting that “Laws are applied to all Unions consistently” are either naive or lying – I hope it’s the former. New Zealand are a great team, seeming almost superhuman at times. We certainly don’t need to give them this advantage. We can only hope that the referees and IRB will take some action on it. Update: someone on boards.ie said that only 2 of the yellow cards in the 2010 Tri-Nations were awarded for ruck offenses, the rest were for violence or dangerous tackles. The point was made that you can dress up stats to prove any point. I agree with that, but it doesn’t invalidate the overall point of this post. As the IRB are happy to mis-use stats to say that scrums are fine (which they’re clearly not), I’m happy to mis-use stats to say that McCaw is getting away with murder at the ruck (which he clearly is). I don’t really care about the stats at the end of the day, but I would like to see NZ getting policed properly. They’re good enough when they’re playing normally, without giving them a further advantage. The IRB are never going to admit to a bias, or any shortcomings when it comes to refereeing/discipline. The All Blacks seem to still be the poster-team for the IRB when promoting rugby internationally and why not? They are successful and have a good disciplinary record? By highlighting breaches of discipline etc. by penalising them during games/citations they tarnish that. Totally agree. And what’s more if they don’t sort by World Cup time the tournament could descend into a farce on and off the pitch right when the global spotlight is on the sport. The statistics just prove it… But referees always allows the team the think “should” win more lenience than the other team, or is it just me? I try to be unbiased and this is what I think is happening with referees.